Ritual Tavern, Kitchen and Garden is happy to announce . 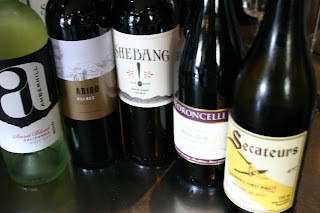 . .
Every Thursday in May will be ‘Third off Thursday.’ Save 33% Off All Bottles of Wine! This will be the perfect opportunity to fall in love with our new wine list. Among the additions are Amberhill ‘Secret Blend’ of California Chardonnay, Sauvignon Blanc and Moscato grapes. This is a bright zesty and refreshing white. Also new on the list is a South African Chenin Blanc. Secateurs (South African for pruning shears) from Badenhorst Family Wines is a refined dry white, excellently structured with a balance of citrus and spice. You'll definitely be psyched to have a bottle of Secateurs! On the red side of the wine list are two new robust heavy hitters. Shebang! Fifth Cuvee is a blend of just about every grape in the North Coast. This blend is full bodied with a hint of sangria and robust clove spice. Another darling is Pedroncelli Dry Creek Valley Petit Sirah. The Pedroncelli family has been growing grapes there since 1937, so you can imagine they are practically defining the Petite Sirah style in this bottle. This is an immensely robust, full flavored and memorable wine. We are all about the quality and value within these wines, and we can’t wait for you to come in and enjoy them paired with our food.